Entries categorized "Menu for Hope"
Each December for the last three years, food bloggers from around the world have joined forces to raise money for charity through the Menu for Hope campaign. Started by Pim Techamuanvivit of Chez Pim, Menu for Hope is an online raffle of dozens of food-related prizes, with the proceeds going to an important charitable organization. Last year, the event raised over $60,000 for the UN World Food Programme, which will also be the beneficiary of this year's campaign, Menu for Hope 4. Participating food bloggers have donated an astonishing array of prizes, from specialty foods to autographed cookbooks to dinner for 2 at some of the finest restaurants...and surely there will be some unpredictable surprises, as well. All you have to do is donate some money (for which you'll receive “virtual” raffle tickets – one for every $10 donated), and any of these prizes could be yours. The campaign runs from December 10 – December 21, with raffle winners announced on January 9. I've chosen to contribute a selection of 6 of my fine preserves and condiments. If you're a regular reader here, you may know that I have a sideline in putting up delicious things in jars and selling them at the local farmer's market (and through a growing mailing list). Here's everyone's chance for a sample. Descriptions, and instructions for participating in the raffle, follow after the jump. 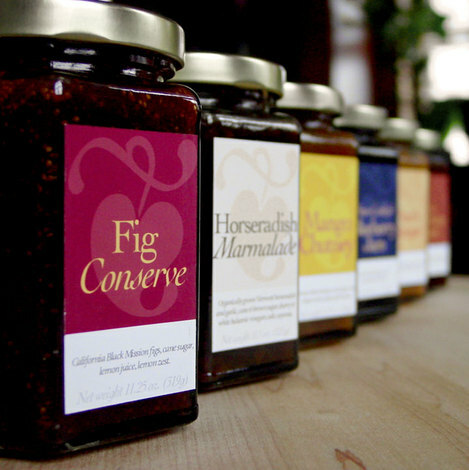 Left to right: Fig Conserve, Horseradish Marmalade, Mango Chutney, Sun-Cooked Blueberry Jam, Sun-Cooked Peach Butter, Spicy Tomato Jam.